So how does it work? We’ll compare the overall branding of each series and see how they match-up. This includes the logos, alternate logos, jerseys, historical logos and jerseys, general legacy and everything else that builds a team’s brand. And it will be drawn from just the visual brand component (aka: categories 1 through 4) from our handy and comprehensive brand rankings that we did at the beginning of the season to help us out. So over 6 post-seasons, we’re 49-for-90, or 54.4%. 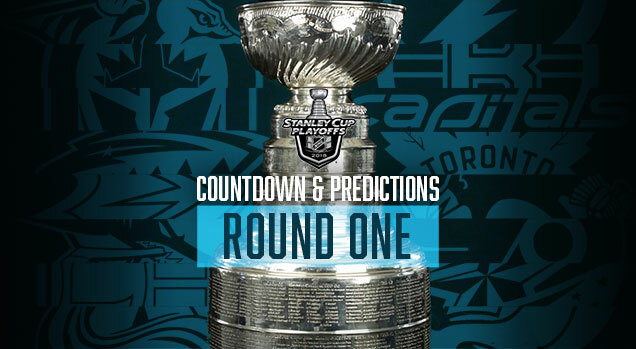 I think we can now definitely say that good branding and design will help you win in the playoffs, right? Right? Bueller? At first, I liked this jersey match-up: contemporary colours, a lot of bright visual energy, good amount of contrast between the jerseys. But, the more I look at it, the more it’s just too much. The colours start to clash the more you look at it, it grates on your eyes and becomes painful to watch. And I mostly blame Nashville. 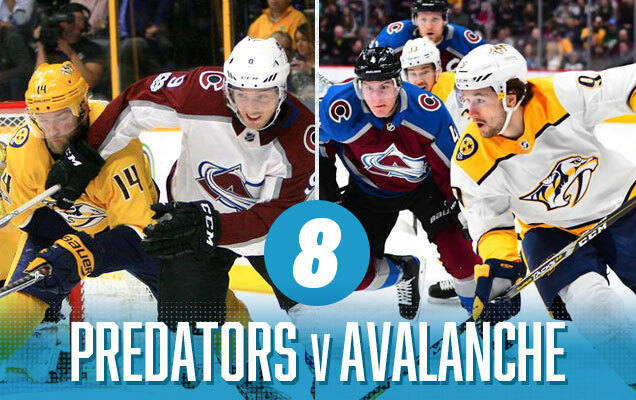 The Avs have one of the most improved jerseys from last summer’s Adizero updates, but the Preds represent the most colossal downgrade, going from unique and innovative to abrasive and coying overnight. And while the gold helmets didn’t bug me as much last season, but this season, with the jerseys that feature even more gold, it’s way too much. 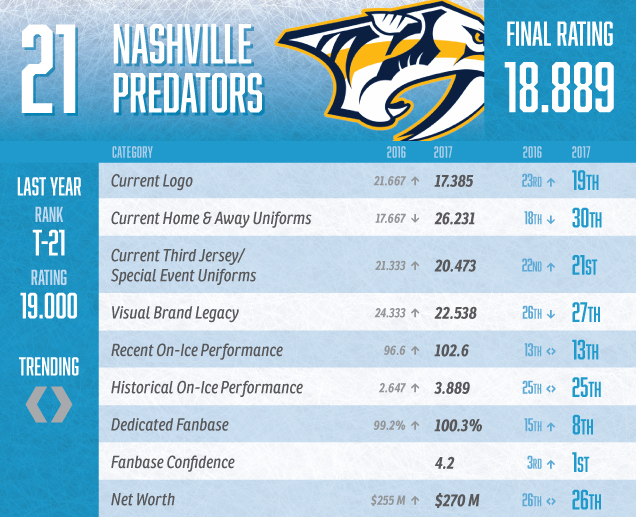 Nashville Predators Visual Brand Ranking: 30th. Our rankings gave them the worst regular jerseys in the league and a bottom-5 visual legacy. Not hard to see why their second-last. 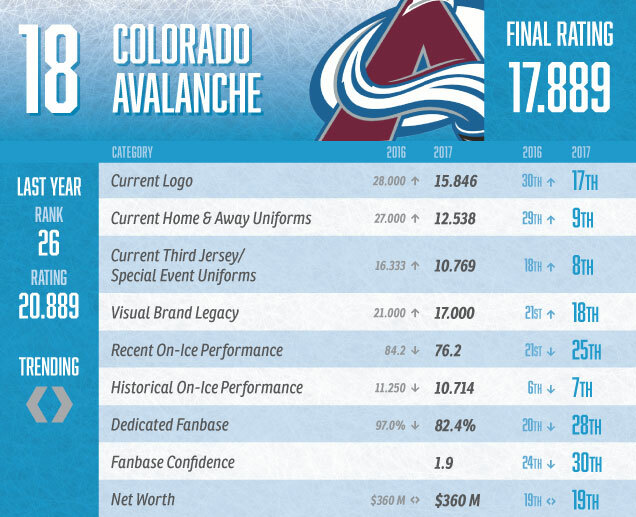 Colorado Avalanche Visual Brand Ranking: 12th. Their much-improved jerseys bumped them into the Top 10 in that category, as did their nice alternate jersey from last year. The other categories are mediocre, but they’re also facing the one of the worst visual brands in this matchup. Welcome to the playoffs Vegas! It’s kind of sad when it’s the grey/black and white/grey jerseys that bring the most colour to the match-up. 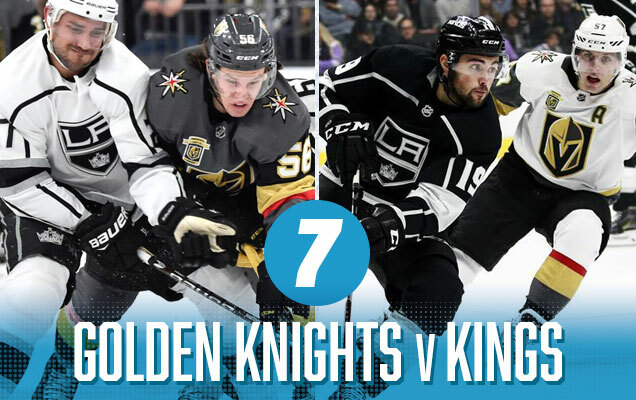 The little flashes of gold are nice to see in this match-up…and yes, the red as well, but only because the Kings bring so little to the table. Otherwise, it’s easily the most monochromatic and boring visual match-up from the entire first round. The bright spot is that since Vegas gets home-ice advantage in this series, we’ll only have to suffer through those white gloves for a maximum of three games. Vegas Golden Knights Visual Brand Ranking: 26th. 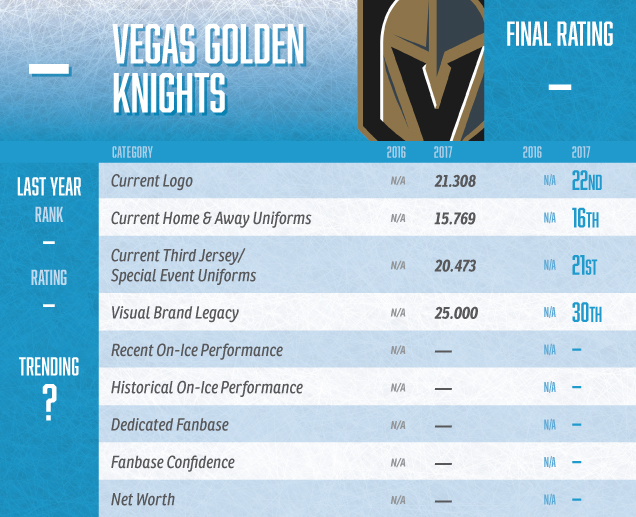 The visual brand component was the one area that we could rank the Golden Knights in our annual brand power rankings, and they didn’t do too well. To be fair, it’s hard to have a great visual brand legacy in your first season. 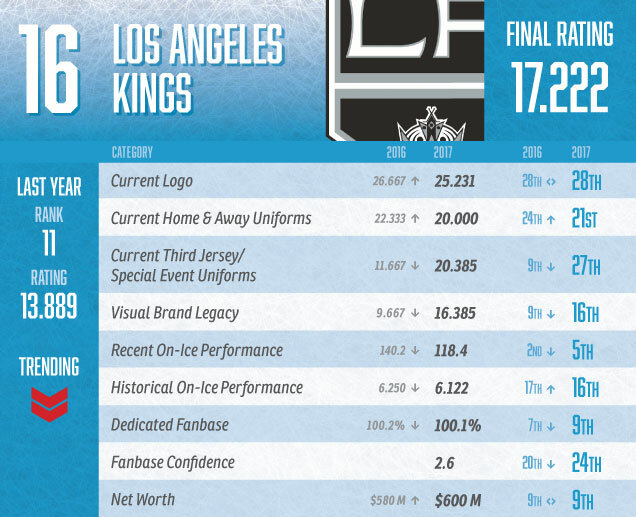 Los Angeles Kings Visual Brand Ranking: 27th. Oh, and look who’s right behind the Knights! With one of the worst logos in the league, and mediocre-to-bad rankings in the rest of the categories, the Kings don’t manage to take advantage of facing an expansion team in the playoffs. It’s a race to the bottom with these two. It’s the match-up of the two most patriotic jerseys in the league. There’s red, there’s white, there’s blue, and there lots of stars and stripes. 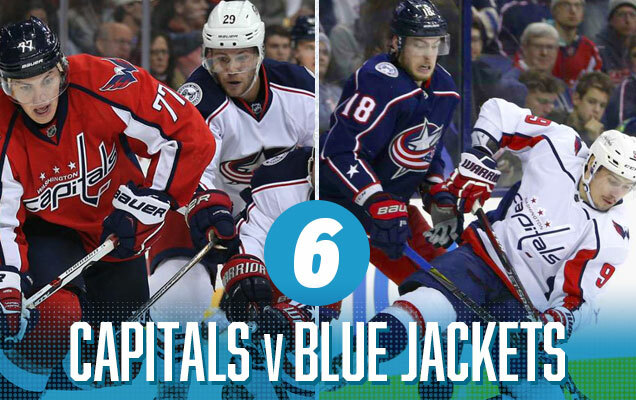 It’s also one of only two class red-vs-blue matchups in the first round. And while this would usually get it some points, the problem is that neither of these jersey sets are the great. Bad logos, mixed with erratic striping from the Caps and minimalist (in a bad way) striping from the Jackets make this a match-up that has it’s classic peaks (visually speaking), but also some deep valleys. 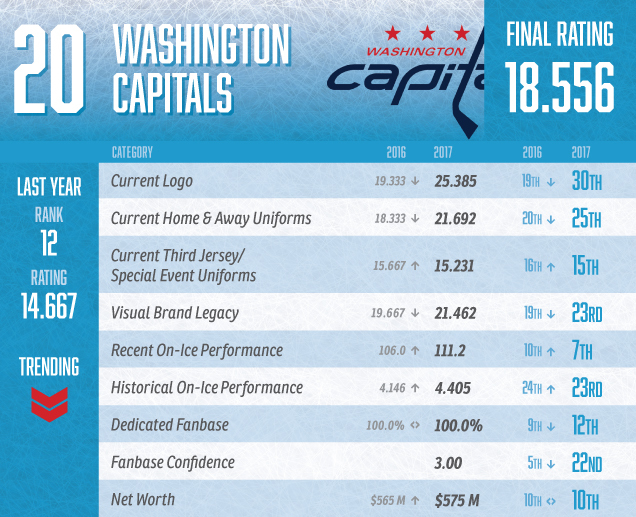 Washington Capitals Visual Brand Ranking: 28th. Being burdened with the worst logo in the league isn’t going to help any brand, but lacklustre efforts with their jerseys and, let’s be honest, they haven’t worn a really great jersey ever, means that they’re not really improving through any other category either. As a certain DC resident might say…Sad. 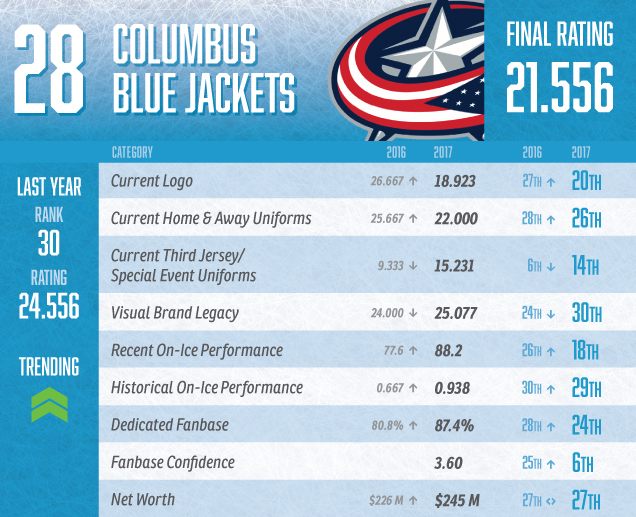 Columbus Blue Jackets Visual Brand Ranking: 25th. Aside from Vegas (which has no legacy to speak of, being an expansion team), Columbus has the worst visual brand legacy in the league. Uninspiring jerseys and mediocre results elsewhere in their visual brand keeps them well in the bottom part of the league. But it’s still better than the Caps! Anaheim? This far up? I’m as surprised as you are, but the annoying inconsistent stripes and beige/0range combo is actually balanced somewhat by the simplicity and relative minimalism of the Sharks jerseys. And the orange and teal combo represents a complimentary colour combination. 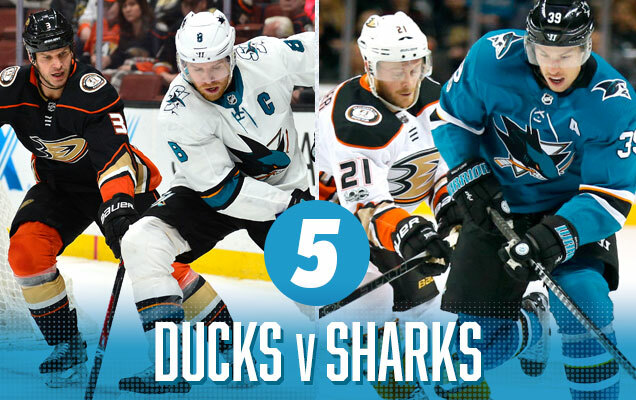 There’s still not enough orange in the Ducks’ predominantly white and black jerseys, but the Sharks do their part to drag the Ducks up these rankings, kicking and screaming all the way. 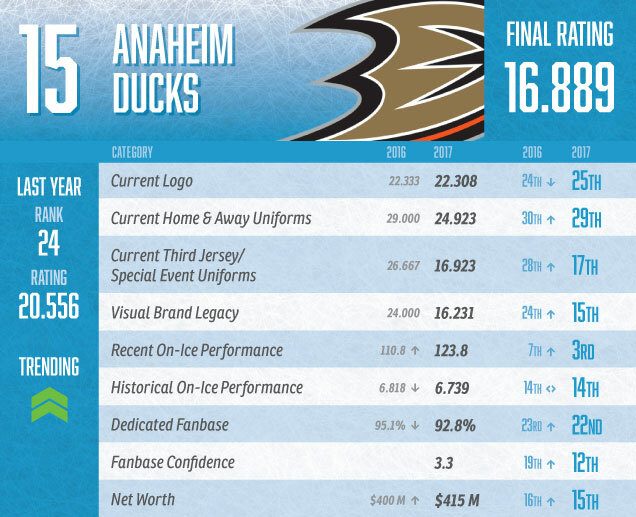 Anaheim Ducks Visual Brand Ranking: 21st. Nostalgia wins the day in Anaheim, as their brand legacy (and use of that brand legacy in their most recent third jerseys), push them further up these ranking than this humble writer thinks they deserve. The only thing keeping them in the bottom third of the league are those atrocious jerseys. 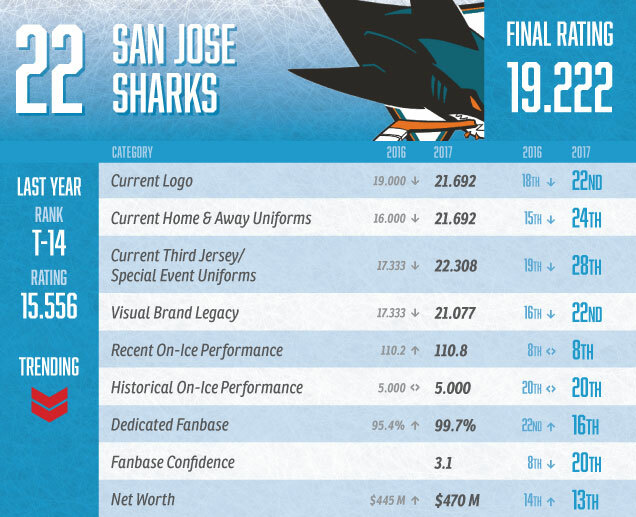 San Jose Sharks Visual Brand Ranking: 29th. All the worst visual brands are showing up in the playoffs this year. 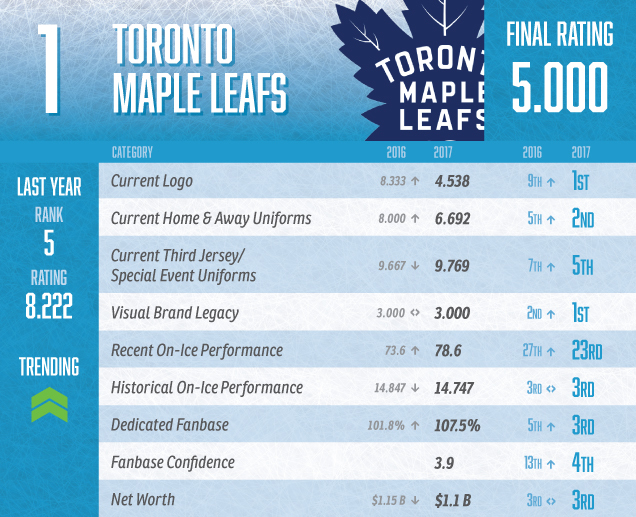 The updated 2017 Brand Power Rankings were not kind to the Sharks, at least from a visual brand perspective. Laden with bottom-third rankings in all the visual brand categories push the Sharks down, deeper than an ocean abyss. Because sharks, right? The other red-vs-blue classic match-up features Tampa and New Jersey. Both of these jerseys are clean, minimalist, and – on their own – quite nice. But when they’re faced up against each other, it’s almost too minimalist with not enough character and too much contrast, especially with the Devils’ heavy-on-the-black approach. 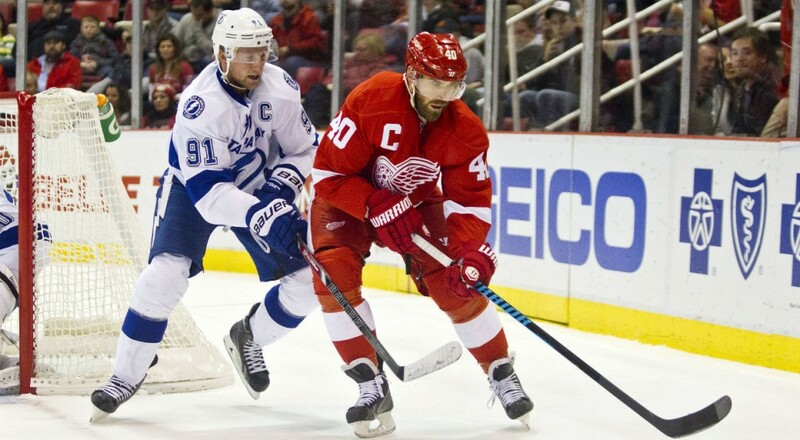 For example, the Bolts versus the Red Wings…beautiful! Somehow, New Jersey has just enough elements to make this match-up less interesting. Design is weird sometimes. 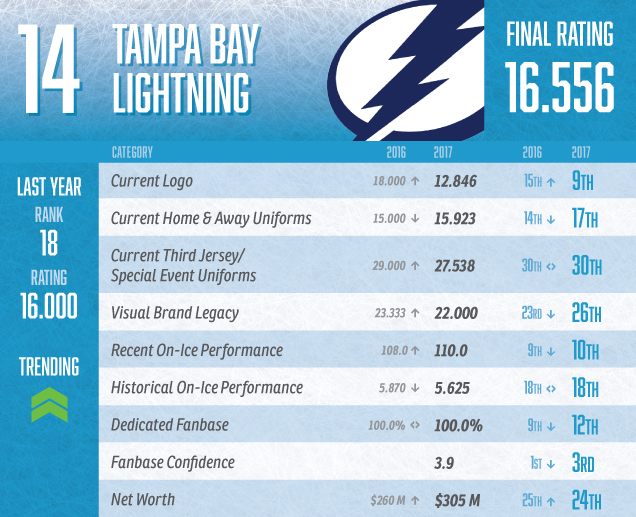 Tampa Bay Lightning Visual Brand Ranking: 19th. Nice logo, pretty good uniforms, and a disastrous jersey legacy featuring some of the worst things that ever graced the ice, not to mention some of the worst third jerseys we’ve seen in recent years. It all leads to a middle-of-the-road ranking. 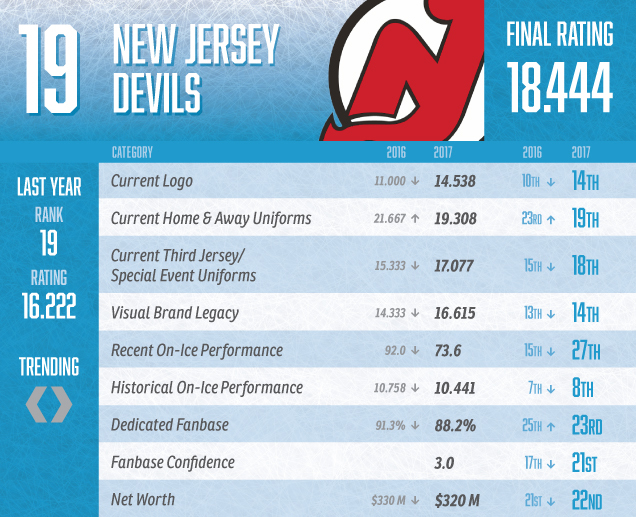 New Jersey Devils Visual Brand Ranking: 17th. From a visual brand perspective, New Jersey has nailed the bland category. It sounds insulting, but it’s not meant to be. The Devils have just never been very adventurous at all with their logos or uniforms (Hi there Lou! ), which gives them the expected middle-of-the-road result. Solid, but nothing exciting. Now we get to the really good stuff. 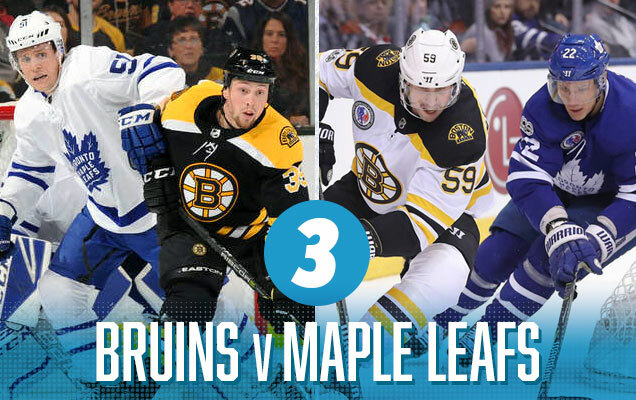 A classic Original Six matchup between the Leafs and Bruins feature classic jersey designs that use a nice amount of colour and contrast to make for a great visual matchup. 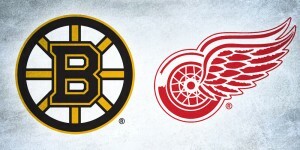 It works because the Bruins bring a lot of gold into their jerseys, and the gold versus blue looks great. The game in Boston are a little bit lacklustre, mostly because of the Leafs not bringing enough blue to the table against a predominantly black Boston jersey, but hey, at least they’re not wearing all-white, amirite? 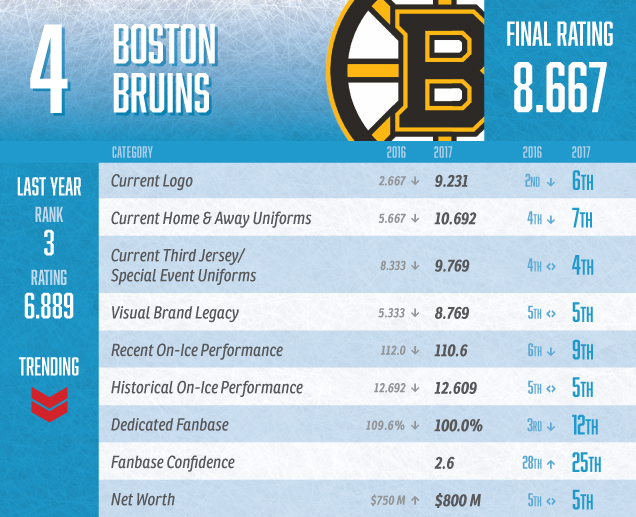 Boston Bruins Visual Brand Ranking: 4th. All the Bruins’ visual brand categories rank between 4 and 7. They’re among the best in every single category from a visual brand perspective: great logo (2nd best imo), great jerseys, great legacy. They’re a beast. Really, how could they lose? I accept catching some flack for this one, but there’s so much to like about this jersey matchup. There’s equal amounts of black and white to make these jersey visually connected, but the bright gold against the bright orange make sure they stand apart from each other very clearly. It’s energetic, it’s aggressive without being abrasive, it’s two different approaches to classic jersey design that still both use simple blocks of colour to make them look cohesive together. It’s really pretty brilliant and a lot of fun. 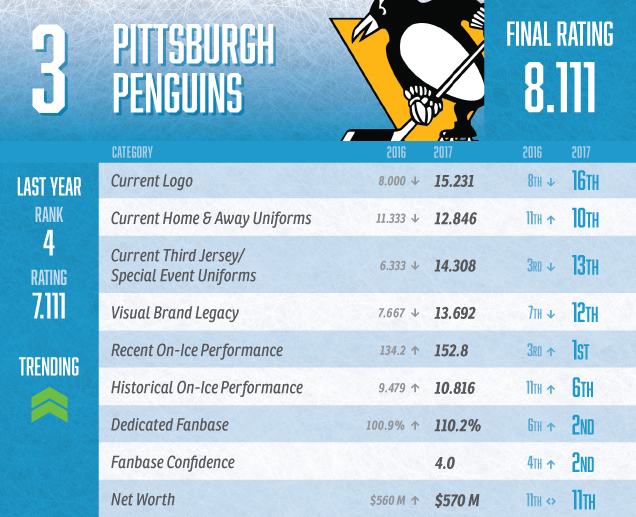 Pittsburgh Penguins Visual Brand Ranking: 10th. While the Penguins don’t necessarily excel in any of the visual brand categories, they definitely don’t suffer in any of them either (especially with their new/classic jerseys), with all the rankings hovering in low-to-mid teens. It allows their visual brand squeak into the top third of the league. 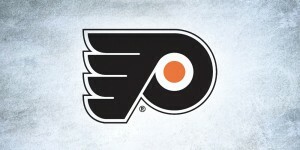 Philadelphia Flyers Visual Brand Ranking: 15th. 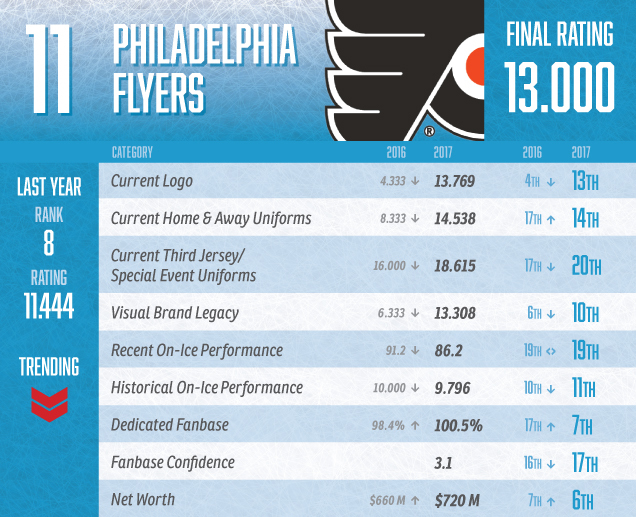 The Flyers are decidedly middle-of-the-pack when it comes to their visual brand – never above 10th, never below 20th – in their categories. Personally, I value their visual brand much more than our Brand Power Rankings do – their logo is top 3, easy…don’t @ me – and I’ve always loved their latest/classic jerseys. But hey, the rankings are the rankings. What I like about this match-up is that both sets of jerseys are full of contemporary and (relatively) unique colour schemes, with no black anywhere to be seen. 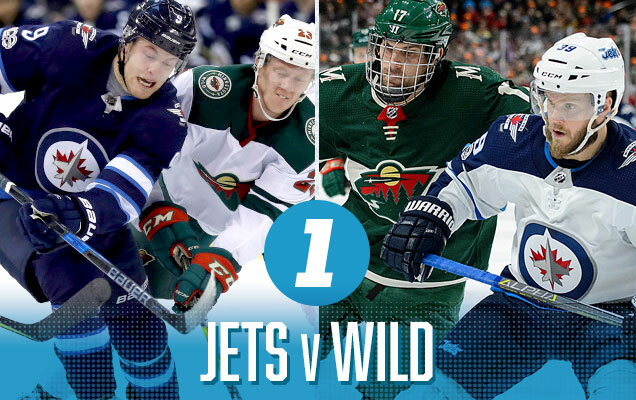 The Jets’ two tones of blue are nicely offset against the Wild’s predominantly forest green jerseys, and both have strong, solid chunks of colour that keep them visually cohesive when they’re on the ice together. But what really sells it for me is that both have small elements of red to visually connect them, creating a visual string that runs through both jersey sets. 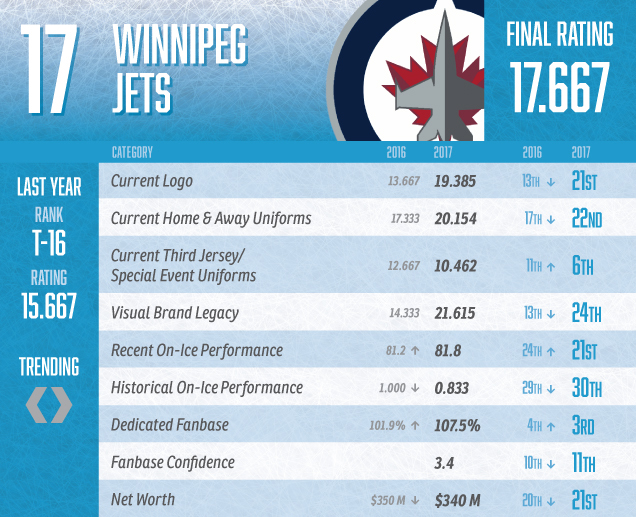 Winnipeg Jets Visual Brand Ranking: 18th. Another ranking being slightly propped up by nostalgia, the Jets’ most recent Heritage Jerseys move them up the rankings in terms of a visual brand. But their logo and current uniforms flounder in the bottom third of the jersey. Might that improve as the Jets find some success? Because success always makes a jersey look better. 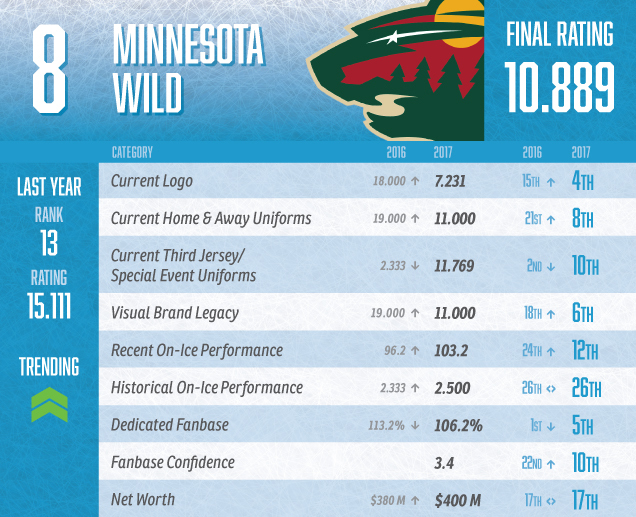 Minnesota Wild Visual Brand Ranking: 5th. 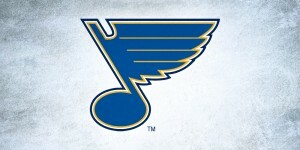 The logo is loved, that’s for sure, as they’re sitting at 4th-best in the league. That, and some really great, understated jersey design over the last decade has solidified their visual brand as the best to emerge from the most recents waves of expansion in the last 20+ years. 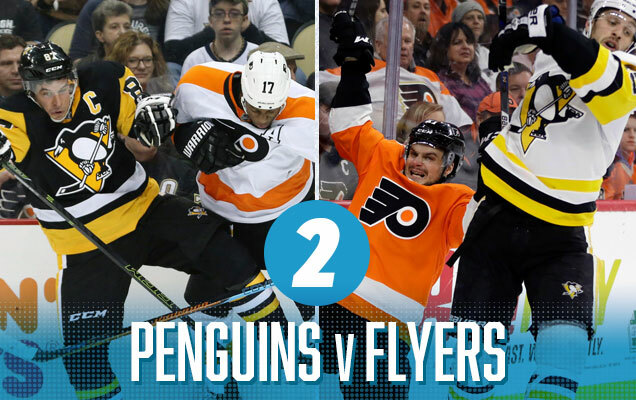 I think Pens vs Flyers or Devils vs lightning are the best ones. When they were first unveiled, I hated the Devils new unis, but after watching them throughout the season they’ve really grown on me. But the Devils away set… I have that in my team p ten away unis in the league. By the way, you probably should have put the squeamish warning BEFORE the link… yeah… that could have not been pleasant. Thankfully, I’m not that squeamish. Thanks for the reminder, I was going to delete that squeamish before posting but forgot. It’s gone now! Yeah, I’m not as big on the Devils/Bolts match-up, especially after seeing them tonight. 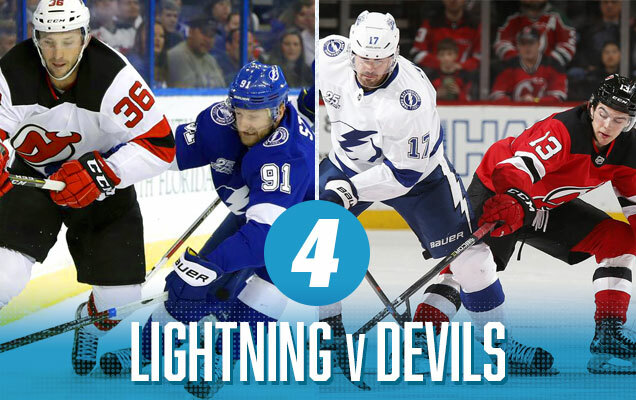 Feels like the Devils road jerseys need more red, but it’s still not a bad matchup in comparison to some of the others.